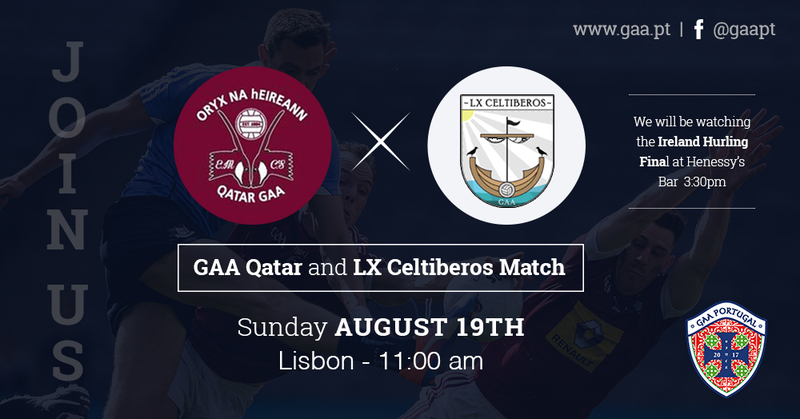 LX Celtiberos will play an all-inclusive, friendly match against Qatar GAA on the 19th of August! All welcome. Metro: Yellow line in direction to Odivelas, exit the metro at “Lumiar” metro station. It is roughly 20 minutes walk from Lumiar station. - Catch the 736 (From Cais Sodré to Odivelas) and get out at Quinta das Conchas bus station and walk 19 min to the destination. - From Sintra. 30 minutes. What: Friendly football match, both mens and mix gender teams. When: August 19th, 2018 from 11h - 12h 30. Players should be at the location by 10h. Competition Format: 11 player per teams , plus subs. Note: Players will not be allowed to use Aluminium studs on their boots as the match will take place on astro truf. Register your interest. We will connect you with people in your area, notify you when training begins or social events are planned. If there are not enough people in your area to form a team you are welcome to join other teams when we travel to tournaments. Our aim is to have at least one Portuguese team competing next season. © GAA Portugal 2017 - All rights reserved.